Warsaw Police Chief Scott Whitaker, left, thanks Doug Light for his 22 years of service. 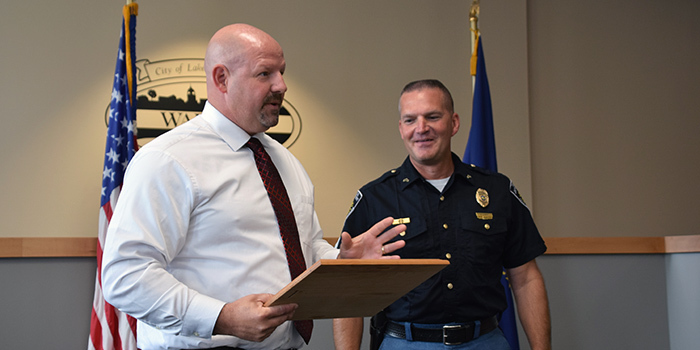 WARSAW — After serving the City of Warsaw with the Warsaw Police Department for 22 years, Corporal Doug Light is retiring effective tomorrow, Sept. 2. City employees took time to honor Light during the Warsaw Board of Works meeting held today, Sept. 1. Light began his career with Warsaw Police Department in 1995 as a patrol officer. He graduated from the Indiana Law Enforcement Academy in 1996 as an honor graduate. He previously served on Warsaw Police Department’s Emergency Response Team and Aquatic Unit, where he was the Aquatic Unit’s commander. He has been assigned to Warsaw Community Schools for the past 11 years as both a certified School Resource Officer and D.A.R.E. Officer. Board Member Jeff Grose also thanked Light for his service. “I really appreciate not only what you’ve done, but what you’ll continue to do for this community,” said Grose. 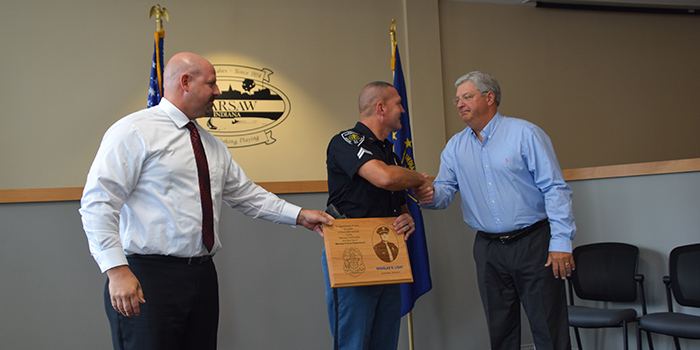 Warsaw Police Chief Scott Whitaker presented Light with a plaque honoring his service. “Corporal Doug Light has been instrumental in the continued success of WPD’s Aquatics Unit and D.A.R.E. program. Light played a significant role in the improvement of our D.A.R.E. program, taking the program to new heights with the improvements in our D.A.R.E. graduations,” said Whitaker. Coworkers, friends and family were present during the meeting. Light took a moment to individually thank his mother Cindy, father Joel and wife Stacie. After his retirement, Light will be switching roles as he takes on the job of Transportation Director at Warsaw Community School Corporation. 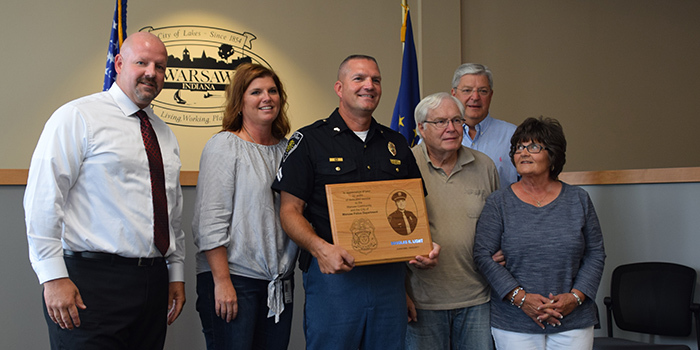 Pictured, from left, are Warsaw Police Chief Scott Whitaker, Light’s wife Stacie, Doug Light, Light’s father Joel, Warsaw Mayor Joe Thallemer and Light’s mother Cindy. Warsaw Police Chief Scott Whitaker, left, holds the plaque as Doug Light shakes the hand of Warsaw Mayor Joe Thallemer.